- Mix the first 9 ingredients - Knead well until you get a smooth dough which is coming off the edges of the mixing bowl. You should also see some bubbles in the dough (Use the hand mixer with kneading hooks). - Cover the dough with a kitchen cloth and let raise for 30 min at a warm place. Dough amount should double. - After 30 min you can knead the dough again, and let raise again. Adding this step will create an even finer bread. - Separate the dough in 24 pieces. - Make 8 braids (each one contains 3 pieces). - Form each braid into a wreath (diameter about 10cm). - Beat the egg yolk. 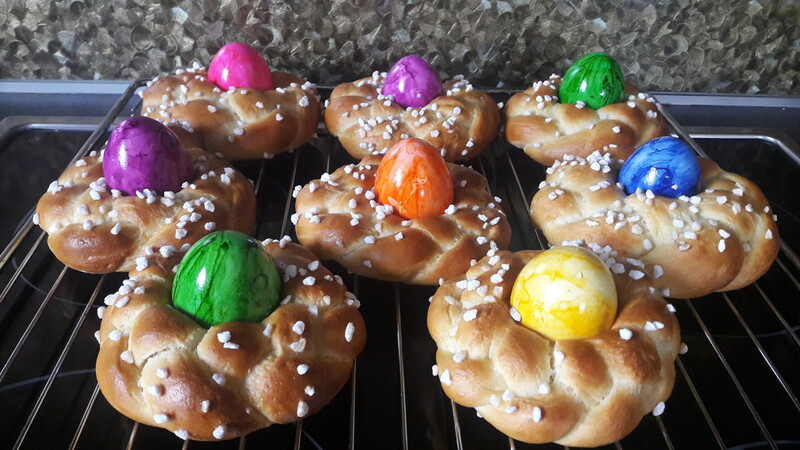 - Pre-heat oven to 175 c or 350 F.
- Brush the egg yolk evenly over each wreath. - If you like sprinkle coarse sugar on the nests. - Bake for 15 min. When the sweet bread nests are done place a hard boiled egg into the middle, press gently so it will hold.